Christmas in Spain is quite a treat - the action gears up in mid-December and doesn't stop until January 6. There is the giant multi-billion euro lottery, splendid nativity scenes, lots of great food and one of the biggest New Year's Eve celebrations you are likely to see. As is the case throughout most of the Western world, Christmas first starts to rear its ugly head earlier and earlier each year. Traditional sweets such as turron and marzipan appeared in supermarkets in late October. However, apart from this, little takes place until December. There are events taking place all over Spain in the run up to Christmas. Here are some of the more important pre-Christmas events. Read more on Spanish Festivals in December. December 7-8 - Inmaculada. Christmas starts here. Inmaculada is the Patron Saint of Seville, where musical groups from the university, known as 'los tunos', gather around the statue of the Virgin Immaculada in the Plaza del Triunfo (behind the cathedral) in traditional dress and sing songs. On the morning of the 8th children dance the Danza de los Seises (Dance of the Sixes) in the square. An event for the whole family. December 13 - El Dia de Santa Lucia, patron saint of the blind. Traditionally the blind sing christmas carols in the streets, although this is less common in modern times. December 21 - the shortest day of the year is celebrated in Granada and nearby Jaen by jumping through bonfires for the fiesta of Hogueras. Where I am from, we are taught that children shouldn't play with fire, however in these parts it is said to keep illness away. December 22 - El Gordo, the massive Spanish lottery, is drawn. This lottery is so big, they start selling tickets in August! Christmas Eve is a family affair. Most bars will be closed and there won't be many restaurants open. If you can get yourself invited to a family then accept, but you're more likely to be offered their youngest daughter's hand in marriage than get an invitation to this most sacred of family events. Proceedings are interrupted at midnight by the chimes of the local church, calling worshippers to the 'misa del gallo' (Mass of the Rooster), so named because it is said that a rooster crowded on the night Jesus was born. The biggest 'misa del gallo' is at the Benedictine monastery at Montserrat near Barcelona. Adults exchange gifts in Christmas Eve and kids will often get a little something, but the young 'uns have to wait until January 6 for that new Playstation. Traditionally also a family day - couples will normally spend Christmas Eve with one set of parents and Christmas Day with the other. 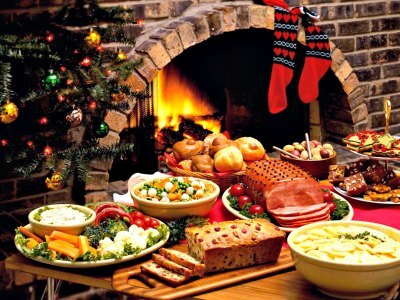 However, in recent years more and more people have started eating in restaurants on Christmas Day. Restaurants advertise their Christmas menu well in advance. It is usually possible to book until quite late, but at least give them a chance to book the ingredients! To guarantee your place, the morning of the 24th is probably about as late as you can leave it. By the evening of the 25th, most shops and bars are open again and these days more and more youths have started going out on the town. Spain's version of April Fools' Day. People stick paper cut-outs of little men, or Monigote to people's backs. A party night like everywhere else in the world, though the structure is a little different to in other countries - remember you have to think in Spanish time! Rather than starting early and building to a crescendo at midnight, the Spanish see in the new year sober (well, nearly sober), either with friends or with family, and then go out to the bars at about 12.30. The partying then continues until about 6am (if you fancy an early night) or much, much later, if you don't! There is an 'ancient' tradition, started by some shrewd farmers about 100 years ago when they were left with too many grapes, of eating twelve grapes at the twelve bongs of midnight. This is a fun ritual, only spoiled by the fact that it is almost impossible to buy seedless grapes in Spain - in the rush to chomp down the dozen grapes, everyone ends up biting into a seed and pulling a silly face. A word of advice - there are four higher-pitched chimes just before the main ones at midnight (known as 'los cuatros') that announce the start of the real ones - make sure you don't start eating your grapes. It catches people out each year - one year a television presenter made fatal error! For every grape you get right, you will get a month's good luck. A typical Spanish Christmas Menu: We have put together a menu for Christmas Eve dinner, Spanish-style. It has several courses and includes tapas or appetizers, as well as dessert and coffee or after-dinner drinks. None of the recipes are terribly difficult to prepare and you certainly do not have to use all of them. Set your Christmas Table: Need some help setting your Christmas table? We give you some interesting tips! Spanish Christmas Sweets: Spain's gastronomic wealth comes to its pinnacle at Christmas time. It is a time for parties and celebrations, and also for big meals with, of course, typical Christmas sweets. These are exquisite, traditional recipes, many of which have centuries of history - something not to be missed at this time of year. Using up your Christmas leftovers: Once Christmas is over, you end up with lots of leftover food... Will you just bin it? Nope! Learn how to finish off with them and have fun! Spanish Christmas Gifts:Christmas is approaching, and you're facing the usual question: What should I buy him (or her)? Well, we've got some ideas... What about something the whole family will enjoy? How about some Spanish Christmas Gifts?